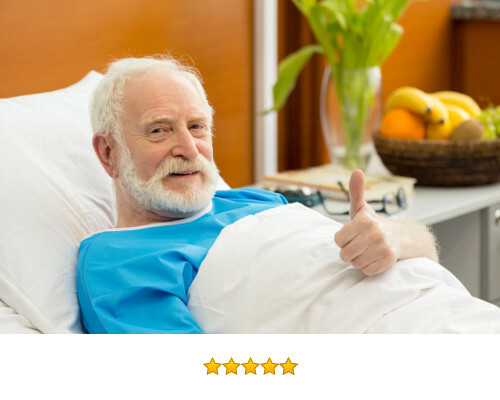 The Purap Mattress System is more effective than gel-foam and low air-loss mattresses in reducing and distributing pressure, which is the underlying cause of pressure sores. The Purap mattress system is 38 x 12 x 3 inches and weighs 10 lbs. It works with existing mattresses. It comes with an anti-skid bottom and waterproof top cover. See the instruction video below. The mattress system increases the contact area with the buttocks and dissipates the pressure away from the pressure points. It maintains optimal skin microclimate. This helps bedsores heal faster. 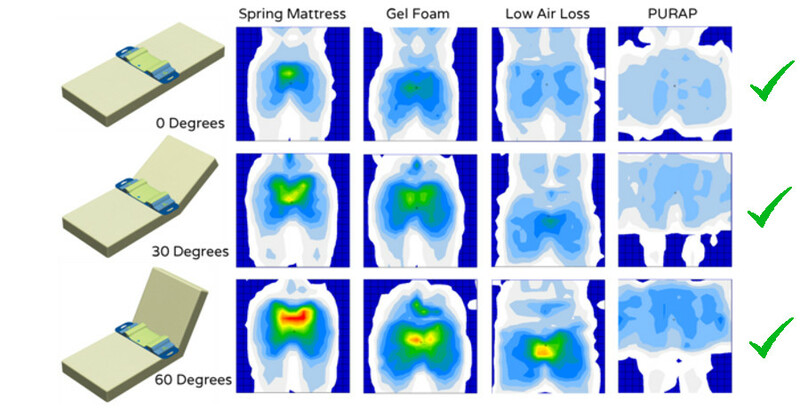 The mattress system virtually eliminates focused pressure points (e.g. over bony areas) which can cause bedsores. It reduces peak pressure and provides a more uniform distribution of pressure, which prevents new bedsores from occurring. The mattress system requires no pumps or adjustments. It is noiseless and helps patients sleep peacefully. It is lightweight and can be used on any existing mattress. Our customers have bought the Purap mattress system for their parents, spouses, their elderly relatives and for themselves. Here are just a couple of the testimonials. I was desperate when I ordered this for my Mom. She regularly got pressure sores on her hips that made sitting in chairs or lying in bed a real torture. We tried wedges to keep her lying on her side in bed. I bought special cushions and "egg crates" for every chair, most purchased from Amazon. Mom's sores would go away for awhile, but they always returned in a couple of weeks. Then I searched Amazon again for another solution and discovered the PURAP. I hesitated a long time because of what I thought was a very high price. But then, I'd bought special chair cushions for $100 that were practically useless after a short time. I'm thrilled to say that as soon as the PURAP arrived, the sore that had plagued her for a week just began to disappear. Frankly, I was afraid to credit the PURAP -- nearly any cushion had seemed to work in the short term. But now on June 2, I can report that Mom has not had a single sore or any discomfort, whether sitting in a chair or lying in bed, since the PURAP arrived in mid-March. This is the longest time she's had this kind of relief and comfort in a year. I am so grateful that all I can say is "Thank you, PURAP!" And to anyone else with an elderly parent who hesitates because of the "high price," I assure you that in my house, this solution is considered priceless. My husband has a C-3,4,5 spinal cord injury for 17 years (quadriplegic) & has been fighting a decubitus ulcer for 8 weeks. We tried everything including a low loss air mattress and nothing has helped. No relief. The PURAP bed system along with the PURAP wheelchair cushion have been lifesavers! He was actually able to sit up and sleep in comfort for the first time in 2 months. From the first use, he started to heal. I can not express enough how effective this system has been.I read every review prior to purchasing these items last week but was still skeptical. I was desperate for a solution after using hospital bed, air mattress, foam with hole cut out, beanbag, gel pads, gel overlay mattress etc. THIS PRODUCT IS WORTH EVERY PENNY WE PAID and I WOULD HIGHLY RECOMMEND IT to anyone who is in a wheelchair or fighting a bedsore.